Sandra, (Fun fact) A former MMA fighter, began her wedding day with the modern vibes of the W Hotel in San Francisco. On our way to the venue we had a scenic limo bus ride equipped with amazing panoramic roof top views! Roger and the fellas had a relaxing morning at one of my favorite hangouts, Murphy's Pub in the financial district. We arrived early to The City Club of San Francisco and began formal portraits. The City Club's crown jewel, which covers the grand staircase and ceiling, is a mural by world renown artist Diego Rivera, this was Rivera's first U.S. fresco which dates back to 1931. Before the wedding began I photographed this panoramic photo. This image is six photos shot vertically stitched together, my assistant was standing ten feet away from the couple lighting them with a powerful studio strobe, until photoshop took care of him. Sandra and Roger had a regal Mardi Gras themed wedding with a full jazz band playing the perfect danceable tunes! After the ceremony we quickly took this New Orleans inspired portrait before Roger joined the band. 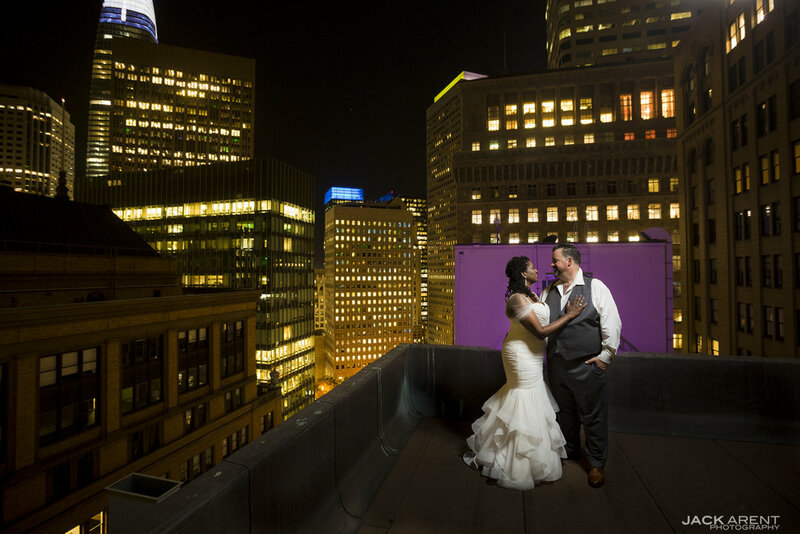 Months of communication and thoughtful planning went into capturing the couple with the famed Diego Rivera mural. I didn't want to simply light the entire scene with a softbox so I lit three specific areas and along with photoshop created this rich and moody portrait, which equally highlights the couple and the mural. Want to learn how we created this? Follow us on Youtube and subscribe to this Blog, during the off season well explain how we created this and other photographs. Words can't explain the awesomeness of this cake by Whipped Up Just for You. At the end of the night we headed back to the rooftop to make one final portrait, here I lit the wall across the street purple as to give contrast and separation so our couple would become the focal point. All in all Sandra and Roger were truly a pleasure to photograph, they knew they wanted their special day documented with technically lit portraits but didn't want to spend a lot of time standing in for photos, for God's sake there was a Mardi Gras party to dance to! I just want to say thank you to the couple for trusting me to do my homework and work quickly when it was time to do so, what an opportunity! Enjoy your photos!